Place of Origin: France, is three-quarters Japanese and one-quarter French (on her maternal grandmother's side), came to France when she was 3 years old. A very quiet and shy girl who came to Paris for her studies. Because the House of Kitaoji and the House of Bleumer are old acquaintance, the Bleumer family took care of her after her father Baron Kitaoji Masamichi left Paris. She is good friends with Glycine since boarding school. Because she has lived most of her life in France, she has a strong interest in Japan. She is well versed in Japanese manners and arts, however, her knowledge although accurate, is mostly based on purely formal traditional manners gathered from books. Because of this, in comparison with the Teito Hanagumi members, she is the closest to the typical image of the traditional Japanese woman (reserved, refined, and obedient to men). She dances at Chattes Noires as "Tatamize Jeune" (roughly meaning a traditional "Japanese girl" in French). She has aquaphobia, because of the trauma of losing her fiancé Philippe de Maleblanche, in a ship wreck, on her wedding day. She wears a black dress as a mourning dress. She frequently visits Philippe's grave. 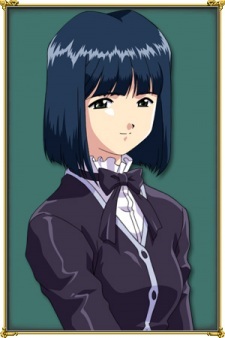 In Sakura Taisen: Le Nouveau Paris, Masamichi Kitaoji, Hanabi's father, comes to Paris for a surprise visit. During a mission as the Paris Hanagumi, she and Coquelicot encounter him in front of Phillipe's grave. Although usually calm and composed, in trying to keep her involvement with the Paris Kagekidan a secret, she panics and starts finishing her father's sentence. In the game, while teaching Ogami Japanese Calligraphy, when Ogami spills ink on his shirt, she starts taking off his shirt to prevent the stain, until she realized what she was doing.